Las Vegas, Nevada (October 30 to November 2, 2018): The 2018 SEMA Show once again commenced in Las Vegas with a new format for 2018 which occurred one day prior to the official opening of the show on October 29, 2018. The annual SEMA Awards which was previously held during the second day of SEMA at the Breakfast reception has now been incorporated with the 2018 SEMA Vehicle, one day earlier, to allow the various media representatives to highlight these most important and prestigious awards. The Vehicle Reveal is an event designed to provide advance look at the most significant vehicles and concepts debuting at the 2018 SEMA Show. This year, as an added attraction, will the announcement of the 2018 SEMA Award Winners on October 29, 2018. The top trending vehicles in five (5) categories were announced: 1. SEMA Car of the Year: FORD MUSTANG; 2. SEMA Truck of the Year: FORD F-SERIES; 3. SEMA 4x4/SUV of the Year: JEEP WRANGLER; 4. SEMA Sport Compact of the Year: FORD FOCUS; 5. SEMA Powersports Vehicle of the Year (Brand new category for 2018): Polaris RZR Turbo S ATV. These vehicles won this prestigious awards were voted by the SEMA Show exhibitors for 2018. The SEMA Aware winners have one thread in common: they represent the cars, trucks, SUVs and now ATVs that aftermarket manufacturers are investing and developing products and accessories for consumers which in turn have the confidence that these vehicles have an extensive array of options available for customization. Ford, having three (3) SEMA Award winning vehicles this year, continues a long tradition of collaboration with the aftermarket community. Similary, the Jeep Wrangler, remains the reigning SEMA 4x4/SUV of the Year winner because it has long provided consumers outstaning array of options for daily driving or occasional off-roading. New in 2018 is the Powersports Vehicle of the Year presented to the Polaris RZR XP Turbo S: as the ATV segment becomes more and more popular, this great new vehicle was awarded as enthusiasts engage in the excitement of off-roading. The importance of the SEMA of the Year Awards emphasize the importance of the partnership between the automakers and aftermarket manufacturers to the annual SEMA Show. For the SEMA Car of the Year, there were five (5) Ford Mustangs debuting at the 2018 SEMA Show: 1. Galpin Auto Sports: This Ford Mustang GT incorporates a Roush supercharger and various Ford chassis bits such as springs and shocks. But the real attraction is the wide-body kit and and the myriad tacked-on aero bits which increase downforce apart from purple and black color scheme; 2. CJ Pony Parts: This Mustang is optimized for drifting so called "Smoke Show" and has a gray paint job with copper accents. Extra power is via a supercharger with suspension modifications and a hydraulic handbrake for drifting; 3. CGS Motorsports: This Mustang had comprehensive brake upgrades, a supercharger and extensive Nappa leather interior; 4. TJIN Edition: This is a unique Mustang as it is the only one which used as its customization base the four (4) cylinder EcoBoost model compensating for this engine with an extroverted exterior and an upgraded turbocharger.The purple color scheme and body scheme is striking and the air suspension will hover this vehicle to the ground; Finally. 5. Bojix Design: the two-tone blue and gray paint scheme aims at retroappeal and blends nicely with the wheels and subdued body kit. There are also no rear seats, upgraded exhaust, springs and brakes. Chevrolet introduced two (2) striking concept vehicles: 1. 2019 Chevrolet Camaro SHOCK and 2. Chevrolet eCOPO 700hp Drag Racer. A new color scheme called SHOCK is joining the 2019 Camaro lineup early next year with an extreme yellow only seem in exotics such as the Aston Martin Vantage. The SEMA concept is a production car with a tweaked front-end, relocated bow-tie emblem and extra graphics on the hood and the fenders. Other extras include: a black rear spoiler, carbon fiber fuel door, black badges, cold-air intake, Recaro seats, upgraded front brakes and suspension from the 1LE package (upgrade to the base 2.0L turbocharged four cylinder model) available at the local Chevrolet dealers. SHOCK is already available as an $395 option on the 2019 Chevorlet Bolt EV. Developed by GM and in partnership with Hancock and Lane Racing (NHRA Competition), the eCOPO Camap Concept demonstrates an electric version for drag racing. This concept car was assembled by more than a dozen students from Bothell High School in Seattle, WA and exemplifies Chevrolet's and GM's commitment to engaging young minds in the STEM education as the goal of zero emissions. A pair of Borg-Warner HVH 250-150-based electric motor assemblies generate 300 lb-ft of torque and a claimed 700hp combined. However, unlike many electric vehicles, the eCOPO utilizes a conventional racing prepared Turbo 400 automatic transmission to funnel output to the rear wheels similar to that used in a traditional petrol powere COPO Camaro race cars. Conviently, the marriage of the drivetrain and engine remain in the same location at GM's facilities. With it, there is an all new 800V battery pack optimized for fast charging and more than twice the voltage of the Chevrolet Bolt EV. It is composed of 4 200V modules weighing about 175 pounds each: 2 are mounted in the rear seat and 2 in the trunk wherein the rear batteries are sealed off the interior of an expanded roll cage for increased module protection. This setup also enhances the eCOPO weight bias to the rear wheels by 56% which is key for launching. The eCOPO project points to the future to include electric crate motors for racing or even street rod. Two final vehicles of note at the 2018 SEMA Show are: 1. 2019 ACURA RDX from Graham Racing Performance (GRP) and 2. 2019 KIA STINGER from the Queensland, Ausralia Police Department. GRP added credibility to the 2019 ACURA RDX A-spec. The Honda IndyCar driver's firm called on the its experience with the Civic Type R for the transformation.The Honda focused tuning firm upgraded the turbocharged inline 2.0L four cylincer engine with new turbos, intake and exhaust manifolds and downpipe. PRL Motorsports adds a custom intercooler and intake. KT Tuning adds a lightweight cat-back exhaust and ECU mapping for a total output of 345hp and 370 lb-ft of torque equatting to an increase of 73hp and 90lb-ft of torque from the stock RDX A-spec car. Power is sent to all four wheels with Acura's Super Handling All-Wheel Drive which can push 70% of the torque to the rear wheels. 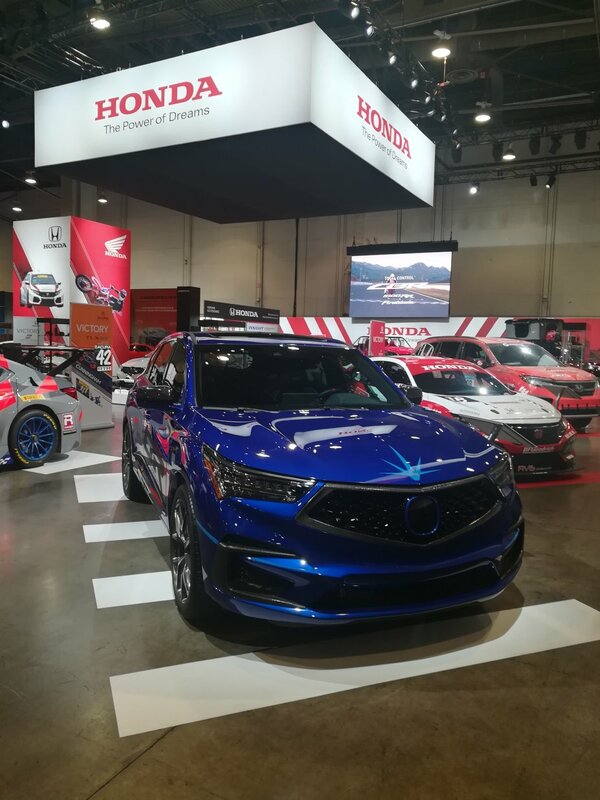 The SEMA RDX also showed beautiful lightweight 21-inch HRE wheels with Michelin Pilot Sport 4S rubber, Eibach springs lowering by 2 inches and six-piston StopTech brakes. Troy Lee Designs from CA added GRP carbon mirror caps and carbon grille accents, carbon interior trim pieces, headrests and custom alcantara and perforated leather steering wheels. Finally, KIA showed off the STINGER and its four-door hatchback rear-wheel drive used by the Police department in Queensland, Australia. It is the first to make it to the Road Policing Division in Australia. This was likely bolstered by the fact that the Ford Falcon and Holden Commodore (both sporty rear-wheel drive sedans) have been discontinued in the Australian market. Interestingly, there were minimal modifications to the stock KIA STINGER: addition of an electrical wiring harness to power the radio, extra lights and siren. Everything else is stock: 365hp twin turbocharded 3.3L V6 with its associated brakes and suspension. The Queensland Police Department plans to have fifty (50) of these "road rockets" in its fleet by the end of 2018. (All photogarphs and text by: Rene Zamora, Photographer, Newsmexx TV, Henderson, Nevada, USA).